Pl. 2 from Ray (1724). 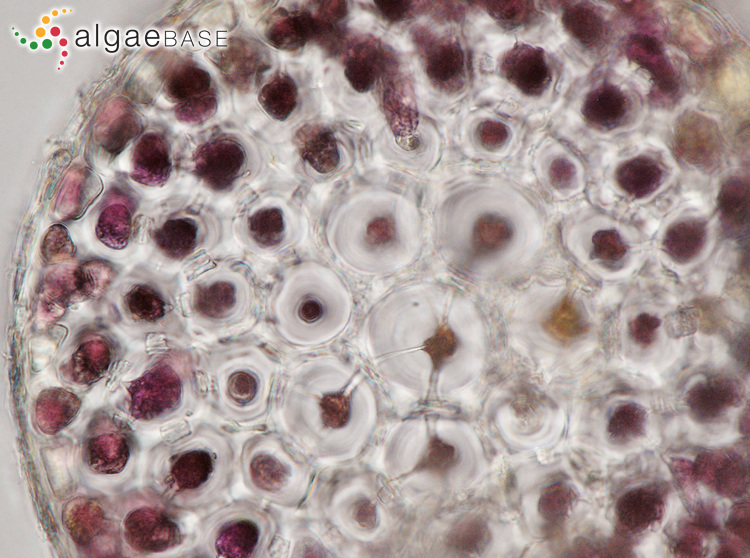 Holotype is fig. 6. 01 Aug 2017. Out of. © Out of copyright. 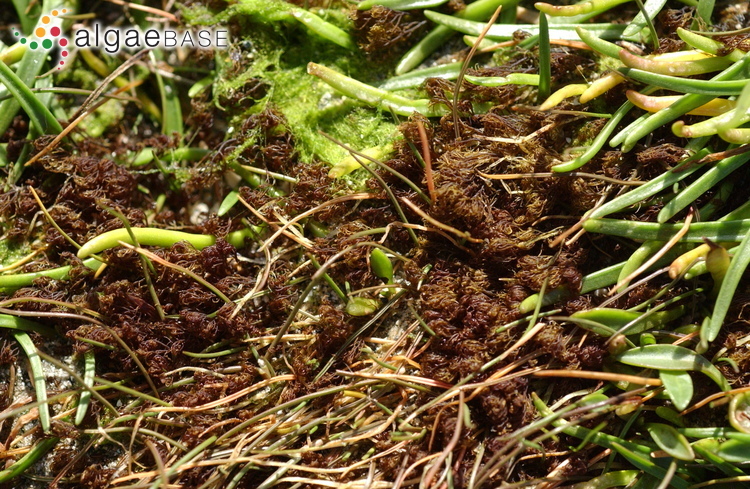 Bostrichia scorpioides, on Juncus, Corrubedo Natural Parc, Galicia, Spain, 2013, Ignacio BÃ¡rbara. Ignacio Bárbara. © Ignacio Bárbara (barbara@udc.es). upper intertidal, Ría de Arousa, Galicia, Spain, 2012. 01 Jan 0001. Ignacio Bárbara. © Ignacio Bárbara (barbara@udc.es). microscope, Portugal, Aveiro, 2007. Ignacio Bárbara. © Ignacio Bárbara (barbara@udc.es). microscope, TS, Portugal, Aveiro, 2007. Ignacio Bárbara. © Ignacio Bárbara (barbara@udc.es). microscope, tetrasporangial stichidia Portugal, Aveiro, 2007. Ignacio Bárbara. © Ignacio Bárbara (barbara@udc.es). Silver Strand, Co. Galway, Ireland; growing amongst flowering plants in saltmarsh. 01 Apr 2002. Michael Guiry. © Michael Guiry (mike.guiry@nuigalway.ie). Published in: Montagne, C. (1842). Bostrychia. Dictionnaire Universel d'Histoire Naturelle [Orbigny] 2: 660-661. This is the type species (holotype) of the genus Bostrychia. Type locality: "Habitat in littore Sussexiano; at Selsey-Island plentifully. Dr Dill[enius]. R. Syn. [Selsey, Sussex, England] (Hudson 1762: 471). Notes: Selsey (meaning Seal Island) West Sussex was once an island. 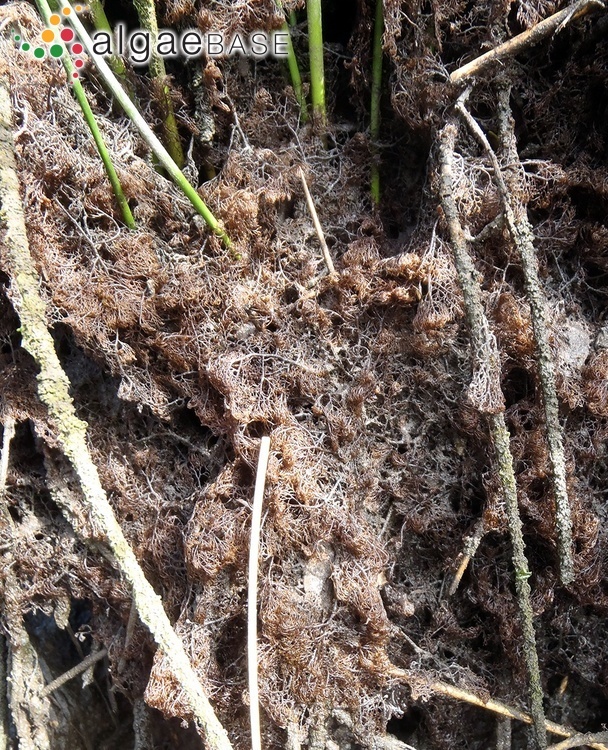 It is likely that the type was collected in the saltmarshes west of Selsey Bill by Dillenius. Dixon & Irvine (1982: 96) selected as "holotype" the illustration in Ray (1724: pl. 2: fig. 6) on the basis that Hudson based his description on Ray. 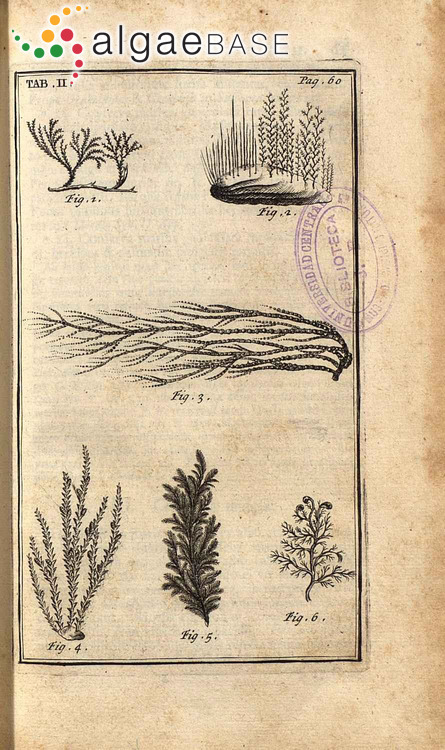 The material upon which the illustration is based is in Dillenius's herbarium at OXF). Art 9.1 [Melbourne Code] specifies "A holotype of a name of a species or infraspecific taxon is the one specimen or illustration [prior to 2007] used by the author, or designated by the author as the nomenclatural type." 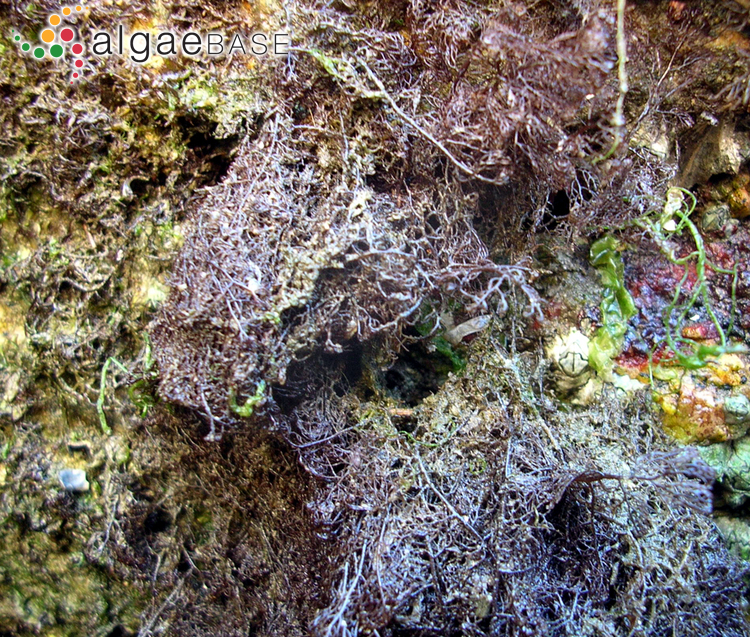 Note from Algae-L (posted by M. J. Wynne, 1 July 2005): "The genus Bostrychia goes back to Montagne in Ramon de la Sagra (1842) Historia...de la Isla de Cuba. But in that publication (vol. 8: 39) Montagne did not make the combination for any species that he was assigning to his new genus. Montagne (in the same year, 1842) also contributed the entry of Bostrychia in C. d'Orbigny's Dictionnaire universel d'histoire naturelle, vol. 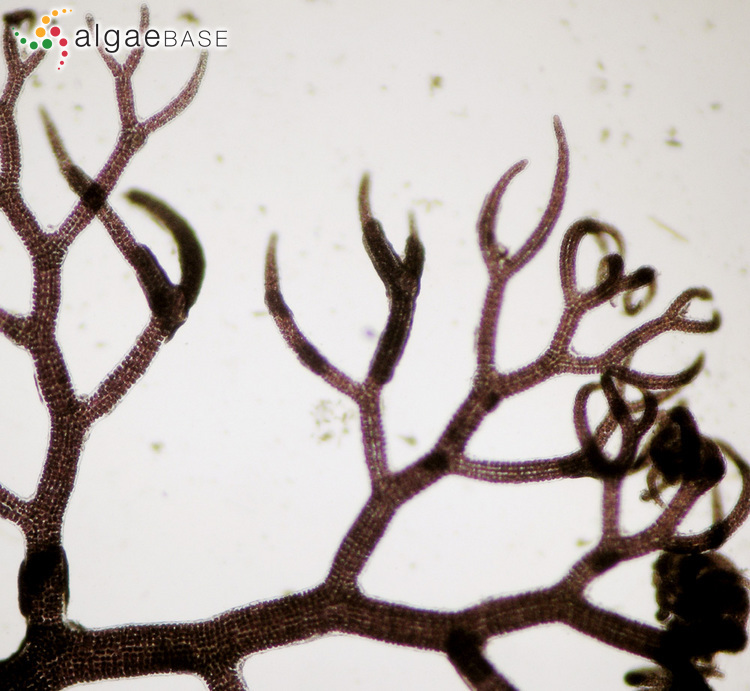 II: 661, and there he made 5 transfers to Bostrychia: B. scorpioides, B. calamistrata, B. radicans, B. calliptera, and B. floccosa. This entry runs on pp. 660-661 is authored by 'C. M.' = Camille Montagne. This Dictionnaire was 13 volumes of text and 3 volumes of the atlas (= 288 pls). Its publication dates are 1841-1849 according to the on-line New York Public Library as well as the on-line Mo. Bot. Gard. Library, or possibly 1842-1849 according to the on-line New York Bot. Gard. Library. Vol. II of this Dictionnaire in the University of Michigan Library has '1849' on the title page, but that title page must have been printed when the series was completed. Paul Silva's card in his on-line Index Nominum Algarum indicates the date of vol. II of the Dictionnaire to be 1842 because it was cited in Oct. of that year in the Ann. Sci. Nat., Bot., ser. 2, 18: 253. So I believe that the evidence is that Montagne in 1842 made the comb. nov. of Bostrychia scorpioides, and is the author, not Kützing in 1849. King & Puttock (1989, Aust. Syst. Bot., p. 9) also credited Montagne (1842). " Day et al. (1995: 252) records this species as being a synonym of Bostrychia harveyi. On muddy shores near high-water mark, on lower stems of saltmarsh flowering plants, widely distirbuted, locally abundant. Irvine, L.M. & Dixon, P.S. (1982). 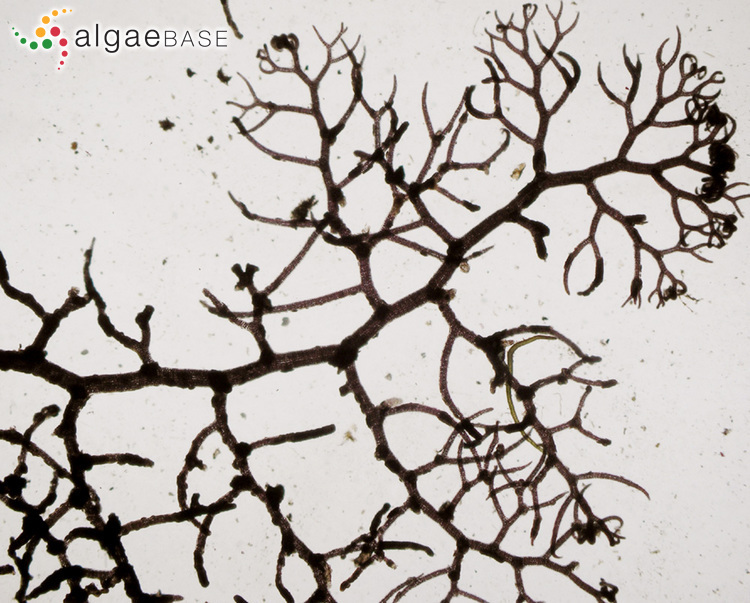 The typification of Hudson's algae: a taxonomic and nomenclatural reappraisal. Bulletin of the British Museum (Botany) 10(2): 91-105. Accesses: This record has been accessed by users 10933 times since it was created. Berg, R.F. de (1949). The New Zealand species of Bostrychia related to Bostrychia scorpioides Mont. Farlowia 3: 499-502. Karsten, U. & Kirst, G.O. (1989). 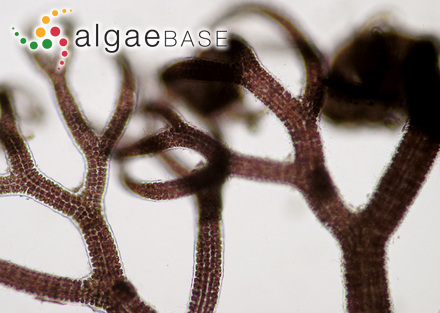 Incomplete turgor pressure regulation in the "terrestrial" red alga, Bostrychia scorpioides (Huds.) Mont.. Pl. Sci. 61: 29-36. Kremer, B.P. (1976). 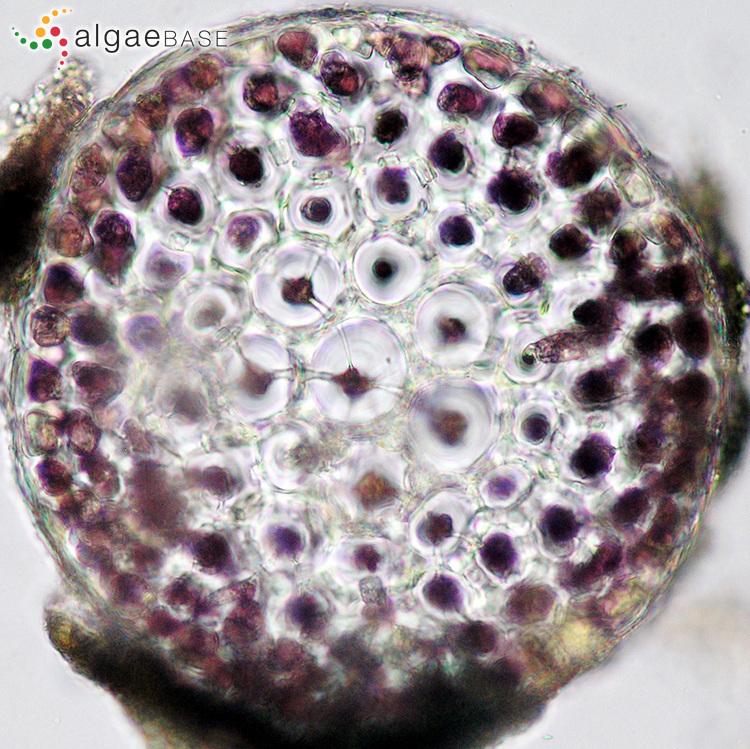 14C-assimilate pattern and kinetics of photosynthetic 14CO2-assimilation of the marine red alga Bostrychia scorpioides. Planta (Berl) 129: 63-67. Mercado, J.M. & Niell, F.X. (1999). Carbonic anhydrase activity and use of HCO3- in Bostrychia scorpioides (Ceramiales, Rhodophyceae). European Journal of Phycology 34: 13-19, 5 figs, 3 tables. Mercado, J.M. & Niell, F.X. (2000). 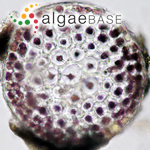 Carbon dioxide uptake by Bostrychia scorpioides (Rhodophyceae) under emersed conditions. European Journal of Phycology 35: 45-51, 3 figs, 3 tables.